Hard to believe? Believe it! New scientific studies have shown massive increases in testosterone. Scientists were SHOCKED by the results of the clinical trials on normal healthy subjects showing an astounding 284% increases in Bioavailable testosterone and 376% increases in total testosterone, not in 8 weeks either – IN 12 HOURS!!! This is a human study with a two-way, cross-over, randomized, placebo controlled "gold-standard" research study – not a rat study, not animals – humans, with shocking, statistically significant results across the board. 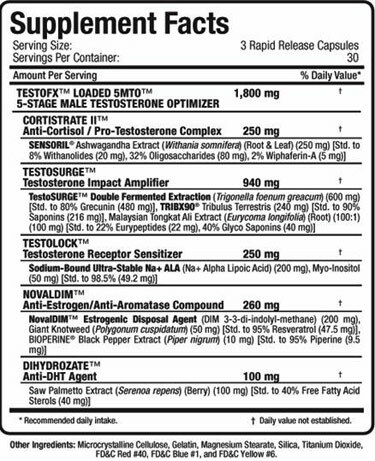 Absolutely new to the market and completely exclusive to new and improved TESTOFX LOADED, TESTOSURGE™ is a new and novel ingredient that will completely re-write testosterone enhancement as we know it. The 'magic' is less of what it is and more of how it works. Completely novel High PLC laboratory testing has standardized the chemical signature Grecunin. And TESTOSURGE™ in TESTOFX achieves a standardization of 80% Grecunin! Everyone knows that when test levels are increased, your body fights back – the more Test you have in your system, the more your body acts to bring the levels down to a baseline level. It works against you to reduce test. It does this by two specific proteins, SHBG and Albumin. They circulate in the blood and actually bind to and DEACTIVATE your TESTOSTERONE. New TESTOSURGE™ in TESTOFX actively drives down SHBG and Albumin in blood plasma to drive up both total test and more importantly Bioavailable test. This has profound PCT and On-Cycle implications that I don't need to describe in detail. The active component of TESTOSURGE called Grecunin actually has another function; it actively drives down Aromatase production. 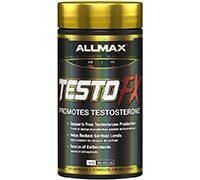 Aromatase is responsible for converting Testosterone (especially "excess" test) to Estrogen and DHT. New and exclusive to TESTOFX is NOVALDIM™, our Estrogen Disposal Agent. New research has found this highly specific chemical isolated from cruciferous vegetation (1,3-Di-Indolylmethane, or DIM) that actively metabolizes Estrogen. In fact, some of the largest U.S. research institutions are presently running several trials on DIMs anti-estrogen cancer mitigating effects! DIM is powerful enough that it commands that level of University level research budget spend. Ultra-Concentrated, Clinical-Strength, Powerhouse Testosterone Booster. Now 3 concentrated caps once daily to achieve peak free-test levels! As Cortisol increases, Testosterone decreases. CORTISTRATE-II™ primes a pro-testosterone environment by reducing Cortisol levels by 32% over 24 hours. Don't let chronically high Cortisol devastate your Testosterone. Elevated levels of the stress hormone Cortisol negatively affect plasma testosterone levels. From an anabolic point of view, the level of free testosterone rises in the blood with use of NOVALDIM™. The mechanism behind this is that 2-hydroxy estrogens (otherwise known as "inactive estrogens") have a greater binding affinity for the blood proteins that "lock up" testosterone in the blood. Thus, these plasma binding proteins instead latch on to 2-hydroxy, leaving greater levels of free testosterone. The 2-hydroxy estrogens promoted by usage also increase testosterone synthesis through another mechanism. Estrogen, even more than testosterone itself, incurs a negative hormonal feedback loop to the pituitary gland, where the rate-limiting gonadotropin for testosterone synthesis, luteinizing hormone (LH) is synthesized and released. What this means is that high blood levels of estrogen, as may occur through aromatization of free testosterone, turns off the release of LH from the pituitary gland. The addition of TRIBX90™ (the 90% saponin, high-potency Tribulus) works to increase this, but NOVALDIM™ adds even more fire power to ensuring LH is being released. This leads to a vicious biochemical cycle characterized by an imbalance between Testosterone and estrogen in favor of the latter. These events, however, are nullified by 2-hydroxy, which doesn't provide the negative feedback message to the pituitary induced by estrogen. The net effect is greater Testosterone synthesis in the Leydig cells of the testes, as well as lower levels of bad estrogen and all the effects that go with it. Directions: Take 3 capsules of Super-Concentrated TESTOFX daily on an empty stomach with 8 ounces of water upon waking on both training and non-training days. TESTOFX has a 12-hour peak testosterone activity measurement. Morning administrations will provide peak levels when your testosterone levels are naturally lowest, which is in the evening. For optimum results, TESTOFX should be cycled. Use TESTOFX for a minimum of 8 weeks followed by 2 weeks off.